Worked for The Motor magazine see the book - From B ouverie St to Bowling Green Lane by A C Armstrong. 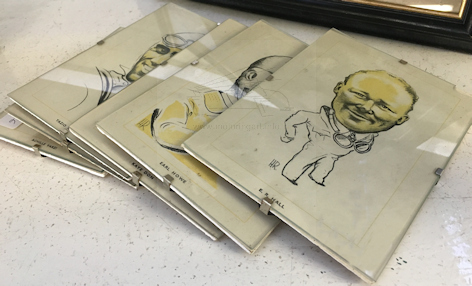 Did caricatures of people see plates for image of Armstrong. Also in the text it says there was a London club - 'Gilsons' frequented by racing drivers that had his work round the walls. Series of 16 racing driver carica tures distributed in The Motor from January to March 1934. They were also available for sale from The Motor for 8d for the set. Caricatures were two-tone and initialled HR.